This species is accepted, and its native range is E. & S. Tanzania. Evergreen tree, 5–18 m tall. Although a total of 15 specimens are known, very few of these are far from Turiani ( T 6) in Morogoro District or Kingupira ( T 8) in Kilwa District and no more than ten distinct sites are known in all, with an estimated area of occupancy of less than 2,000 km2. Threats to the habitat of Cola microcarpa at some of these sites are documented in Clarke, Status Reports for 6 Coastal Forests in Lindi Region, Tanzania (1995), so this species is assessed as VU B2a, b(iii), i.e. “vulnerable”. The only record for T 7 derives from Luke (pers. comm., not verified by me) who cites Luke 11445 from Udzungwa MNP, 530 m alt. Brenan says of C. microcarpa that “ Wallace 906 is said to occur at 1100 m in the Usambaras”. The latter is very likely an error since this altitude is far too high for the species, and if it did occur there, it is likely that the intensive collecting efforts there in the 1980s would have produced more specimens. Specimens labelled as this species from T 4 (e.g. Bidgood et al. 2964 and 2963) represent another taxon that may be the closely related C. mossambicensis (flowers are required), differing e.g. in the absence of shaggy grey indumentum and in the higher altitudinal range (850–1200 m). Iversen records this taxon from E Usambaras according to Luke (pers. comm.) but I have seen no specimen and find this doubtful. Luke (pers. comm.) also reports this species from T 7 at Udzungwa MNP, Luke 11445 which is more credible. Cola microcarpa seems rather more variable than most Cola species in flower shape and size. For example, pedicel width is 0.3 mm in the type collection, yet 1 mm in Milne-Redhead & Taylor 7349. Unfortunately Brenan, who uses this feature in his key to distinguish two groups of species including C. microcarpa, errs, firstly in placing the species amongst those with pedicels 0.75–1.5 mm in diameter (the opposing clause is “pedicels less than 0.5 mm in diameter”) and secondly in his description of the species “circiter 0.5 mm diametro”. Palmer and Pitman (1972; 2: 1491) in Trees of Southern Africa seem first to mention that C. microcarpa extends to South Africa. They give an extensive description and illustration. Drummond in his check-list of Rhodesian woody plants (Kirkia 10: 260, 1975) lists C. microcarpa as a synonym of C. greenwayi, which is surprising since Wild in the Flora Zambesiaca account of Cola does not mention C. microcarpa. No collections have been seen of C. microcarpa from that region and it may be that Drummond was referring to C. mossambicensis (q.v. ), material of which was once referred to as C. microcarpa to which it is closely related. Verdoorn in her paper ‘The genus Cola in southern Africa’ (Bothalia 13: 277, 1981) follows and supports Drummond’s synonymy. However, I am convinced that the South African C. microcarpa sensu Palmer & Pitman ( C. greenwayi sensu Verdoorn) is a related, but distinct and unnamed species. Cola greenwayi can most reliably be differentiated from C. microcarpa by the short rusty-red indumentum of the outer perianth and pedicel (long, shaggy grey indumentum in C. microcarpa) and less consistently by the absence of thick, pale redddish scurf on young stems and petiole. 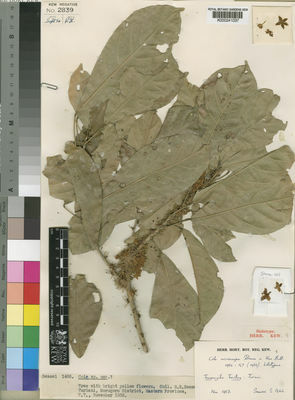 Cola greenwayi occurs between 1100–1830 m altitude, C. microcarpa between 125–660 m.